“New Zealand’s economy relies on exporting products worth billions of dollars to distant markets, and packaging plays a huge role in maintaining the value of these products,” says Technical and Service Leader Lou Sherman. Some products are stored in boxes for over a year before they reach the consumer. In that time they may be stored on a pallet, be subjected to a constant load and exposed to different ranges of humidity. These environmental changes can increase the likelihood of box failure. 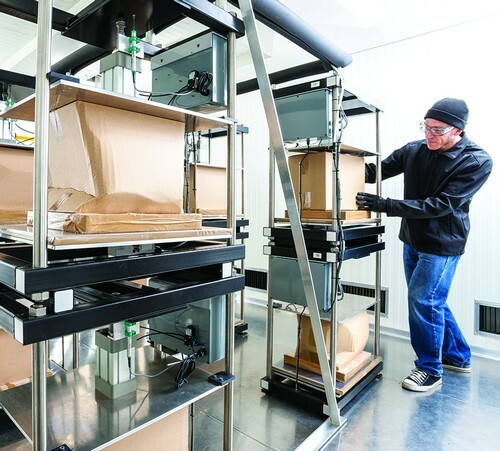 “Because Scion’s box testing facilities are able to evaluate corrugated box designs before they are put into service, many millions of dollars can be saved ...” - Russell Allan, Managing Director, Aurelia Group Consulting. The standard test for corrugated boxes is called a box compression test (BCT). It measures the load under which the box will fail when crushed at a constant rate. This approach has been used for many years to ensure box performance compliance even after the material or box design has been changed. However, it does not accurately mimic the conditions that boxes in real supply chains are exposed to. Typically a box is subjected to a constant load, the box height changes over time, which is known as ‘creep’, and can eventually fail. Cyclic humidity, such as that experienced in cool stores, is known to accelerate creep, making humidity an essential part of an improved and more realistic box testing process. Scion has one of the few facilities in the world that can measure box creep. Our ‘WHITE’ room (WHITE stands for weight, humidity, interval, temperature and experiment) simulates supply chain conditions by applying a constant load to the boxes while the humidity is cycled. The packaging is then monitored over time and compared to different box specifications. Working alongside industry, Scion ran experiments on two types of boxes, which were identical except for their different corrugated mediums (the inner paper in the corrugated flute). These boxes were tested both for BCT and for creep. The BCT method indicated that both types of boxes performed the same. However, creep testing gave very different results. This discovery could reshape how we test corrugated box performance and, thanks to Scion’s unique testing facility, New Zealand-based companies have an advantage in being able to conduct creep testing locally.